The glorious fanned tail display of the peacock, an ancient Indian symbol of mysticism and beauty, fortunately remains a common sight across much of the country, from humid forests to urban gardens. The iridescent blue, green and copper coloured tail feathers of peacocks, or male Indian Peafowl (Pavo cristatus), also serve as important religious symbols, are popular decorative items, and have also found use in traditional medicine. 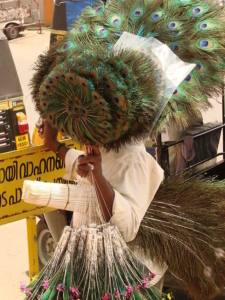 A large market for peacock tail feathers thus exists, both within India and internationally. The trade in peacock tail feathers in India represents an interesting and unique case from a legal and enforcement standpoint. Adult peacocks shed approximately 100-150 tail feathers at the end of each breeding season, and Indian law permits trade in shed feathers, even as India’s national bird benefits from the highest level of legal protection as a ‘Schedule I’ species under India’s Wildlife Protection Act (1972), akin to the elephant and tiger. This remains a notable exception in a legal system that otherwise bans trade in most Indian wildlife and their parts. However, there are growing concerns that the market for peacock tail feathers is also a driver of illegal hunting of peafowl. There are reports from some parts of the country of poachers poisoning peafowl by mixing powerful pesticides into waterholes frequented by the birds. Enforcement against this illegal trade is challenging for two main reasons. First, peafowl are widely distributed and are well adapted to living in landscapes dominated by humans, which limits the efficacy of conventional patrolling based approaches. Further, the only means of distinguishing naturally shed feathers from ones that are plucked in most cases is by examining the base of the feathers – a problem that poachers overcome by trimming the base. The scale of this illegal threat is presently unclear, and warrants rigorous evaluation. We conducted a systematic review of online media reports over the 2013-2018 period and recorded at least 46 instances of illegal peafowl trade being detected by enforcement agencies. These included 32 cases of poaching of an estimated 400 birds, and 14 seizures of plucked feathers totalling over 370 kg. These seizures were distributed across 12 states, and on four occasions were made at international airports (Figure 1), clearly reflecting the large scale and organized, commercial nature of the trade. And yet, our results must only be interpreted as a highly conservative estimate of the trade, given that, only a fraction (perhaps around 10%) of illegal trade is detected by agencies, and an even smaller percentage is reported in media. How does one tackle this tricky situation in which, on the one hand, protecting peafowl is strongly supported by animal rights, conservation and patriotic interests, while on the other hand, the various demands for feathers limits support for an absolute ban on trade in peacock feathers, as proposed by Ministry for Environment and Forest in 2010? The ban on exports imposed around 2013 appears to have worked to an extent, at least in terms of no reported feather seizures at international airports since 2015. However, it is the domestic scenario that poses the greatest challenge. Are there lessons from evidently successful conservation projects for two other bird species in India, namely the Edible-nest Swiftlet (Aerodramus fuciphagus) in the Andaman and Nicobar Islands and the Amur Falcon (Falco amurensis) in northeast India, both of which involve close and thoughtful engagement with local communities? In the case of the swiftlets, which are persecuted for their high-value nests across their range, an innovative programme involving local communities and nest collectors, with support from research groups and the government, has found success in reviving a formerly threatened population on the archipelago, by rolling back a ban on trade in nests. A community-led effort to stop the large-scale poaching of migratory Amur Falcons for meat in Nagaland, again with support from researchers and the government, now promotes a local tourism industry centred around the impressive migration of this charismatic raptor. Could a similar community-based philosophy and approach, guided by research and backed by government, benefit conservation of Indian Peafowl while continuing to permit legal domestic trade in peacock feathers? A community-led effort could strengthen local resistance to illegal hunting and trade, while improving local opportunities for benefits to be derived from legal trade. A key advantage in the case of the peafowl is that such programmes would require no major changes to law or policy, given that legal trade in peacock feathers is already recognized. Another key advantage is that, unlike most other charismatic species in India, the Indian Peafowl is still abundant and widespread, and in fact even expanding its range in some regions. This allows some room for exploration and experimentation with alternate conservation models without the risk of inadvertently driving the species into a conservation crisis. By deviating from the conventional top-down approach to conservation, a community-based conservation programme for Indian Peafowl could set the platform for government and local communities to work together for conservation in the future.